Iron beads were a symbol of royal and priestly authority among Abraham's Proto-Saharan ancestors. One of the shrine cities was Naqada, site of one of the world's oldest known civilizations. The Naqada culture (c. 6000-4000 BC) included the sites of el Badari, Nekhen (Hierakonopolis), Qau, and Gerzeh, where Egyptologist Wainwright discovered meteoritic iron beads, the earliest known artifacts of iron. Stone tools dating to 12,000 years have also been found in the area, revealing a long established human population. This is the region from which Abraham's ancestors came. Today we know more than ever about his Proto-Saharan ancestors. Naqada settlements dating to about 4,000 BC have yielded decorated pottery, clay figurines and objects made of ivory and iron, as well as alien materials like lapis lazuli, indicating external trade. The civilization advanced due to irrigation, trade, political alliances along kinship lines, and the earliest writing. The dead were buried in simple oval pits. Later there were more sophisticated burial practices, especially for rulers and their wives. "Nok" and "Naqada" might refer to the same family. 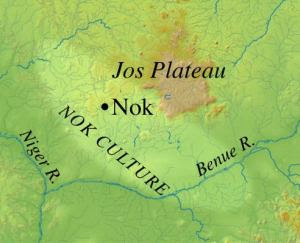 I say this not only because of the linguistic similarity between "Nok" and "Naq" but also because Set (Seth) was venerated at the temple near Naqada, and according to Genesis 4 and 5, Set is Kano's (Cain) brother. The brides of Cain and Seth were Africans of noble status. 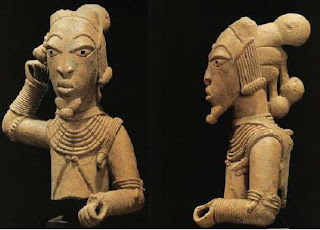 Their father was a ruler of great wealth who controlled the waterways at the confluence of the Niger and Benue Rivers. During this time west entral Africa was much wetter than it is today. The Chadic Sea was about 600 feet deep and sustained boating and fishing industries. The average fishermen used dugouts while nobles used boats constructed of marsh reeds lashed together and sealed with pitch. Cain or Kano means metalworker. Social status (caste) and occupation were inherited from the father. Tubal-Cain (Genesis 4) would have inherited his livelihood from his father, Lamech the Elder, a descendent of Cain. Intermarriage between the lines of Cain and Seth continues with the same intermarriage pattern between the lines of Ham and Shem and between the lines of Eber and Sheba. We observe some common features among the chiefs listed among Abraham's people. They kept flocks, dug wells, and built up their households through 2 wives. According to this pattern there is an association of 3 offices: ruler, priest and shepherd. The Protoevangelium of James says that Mary’s father had flocks and we know that he was in a priestly line. 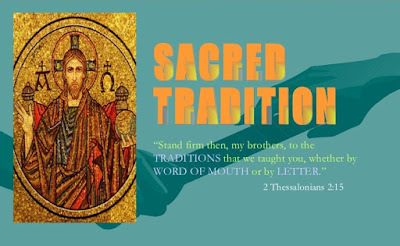 Many priests of the Bible had flocks. Moses tended the flocks of his father-in-law, Jethro, the priest of Midian. What could be more natural than for priests to maintain a source of animals for sacrifice? This has nothing to do with this post but I wanted to bring your attention to a fascinating discussion that is happening at The BioLogos Foundation blog, an organization that includes Francis Collins and is exploring the intersection theology and science. A lot of discussions have focused on Genesis lately. "... Maybe Israel’s history happened first, and the Adam story was written to reflect that history. In other words, the Adam story is really an Israel story placed in primeval time. It is not a story of human origins but of Israel’s origins. ..."
It would be interesting to hear your voice in this discussion. "Whether historical or archetypal, Adam and Eve are the founders of the human race in biblical parlance. They failed to make communion with the Creator their first priority. The prophets criticized Israel for this same failure. Yes, there are patterns in Scripture, but these do not mean that Adam is Israel. The Apostle Paul, who knew the tradition of Israel very well, speaks of Adam as Humanity in need of redemption." I might add that the pattern Enns identifies applies also to Lot, but I doubt that he would say that Lot is Israel.